The Tabernacle built in the wilderness by the contributions of the artisans and congregation of Israel, and constructed by the Spirit-filled carpenters Bezalel and Oholiab at the direction of Moses, was for the sole purpose of creating a holy place in the midst of a people scarred and tainted by sin. 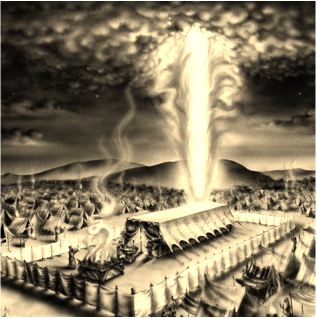 The Tabernacle served as the designated arena within which the Presence of the Most High could commune with His people. It was the central location of all the religious experiences of the Hebrew people for their many years of wandering in the wilderness, as well for a good time after entering the land of Canaan in conquest to capture their promised property. At this Tabernacle, beyond the courtyard, where priests and the repentant prayed together and served the Holy One in careful worship and sacrifices of blood, there was the Holy Place – the inner tent into which only the priests could enter. This room is where incense was burnt on the golden altar, where the smell of the showbread wafted from the golden table in the quiet peace. This solemn space was lit only by the menorah, the lampstand with seven individual lights burning atop its branches. The seven flickering lights of the single menorah allowed the priests to do their daily service before the Presence of the Holy One in this Holy Place. And you shall command the sons of Yisra’El, and they shall bring to you oil of olive, purely beaten for the light, to have the lamp burn continuously. In the Tabernacle of Appointed Meeting, from outside of the veil which is before the Testimony, Aharon and his sons shall order it from evening until morning before YHWH; A statute lasting for their generations, on behalf of the sons of Yisra’El. The responsibility for lighting the lampstand fell not to the priests, surprisingly, but to the people! Those who could not enter into the Holy Place yet provided the oil for the menorah that gave light to those who could. The light of the menorah that allowed the priests to perform their necessary duties, therefore, was essentially on behalf of the congregation of Israel! 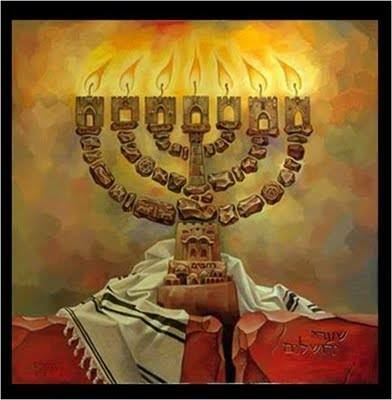 This was Israel’s menorah, Israel’s light before the Holy One! With the passage of time, and coming of the King, David, we read that his heart desired a permanent dwelling for the Presence of the Holy One of Israel. David longed to build a structure that would not be subject to the whims of the people to move it here or there, but would serve as a locus-point for the entire nation to seek. This desire was for a permanent Temple structure to be built. and the pattern of all which he had by the Spirit with him, for the courtyards of the House of YHWH, and for all the rooms surrounding, for the storehouses of the House of Elohim, and for the storehouses of the holy [things]. and the weight for the menorahs of gold, and their lamps of gold, by weight for the menorah, and for the menorah and her lamps, and for the menorahs of silver by weight, for the menorah and for her lamps, according to the service of menorah and menorah. And he made the menorahs of gold, which was according to their ordinance, and set them in the Temple, five on the right hand and five on the left. The total number of new menorahs was thus ten! These would give light with Israel’s original menorah to illuminate the Holy Place. But for what reason are the additions? While the physical reason could be said to give light to the larger Holy Place of the Temple as opposed to a small Holy Place of the Tabernacle, there is a much more significant reason when we look at the spiritual side. Just as the original menorah was lit by the contribution of the people of Israel, and thus signified their presence in the Holy Place, even though they could not themselves enter in, so too, do these additional menorahs point spiritually to the contributions of others! Consider that there are seven lamps on a menorah, and there are ten additional menorahs added to the Holy Place of the Temple, in addition to the original menorah that was Israel’s own contribution. How many total lamps have thus been added, not counting the original menorah that is itself for Israel? Seventy lights were added to the Holy Place by the addition of ten new menorahs! But why? Why seventy additional lights to illuminate the Holy Place? And it shall be in the latter days, the Mountain of the House of YHWH shall be established in the top of the mountains, and shall be raised up over hills, and all nations shall flow unto it. This tells us that all nations will have a part in the worship of the Holy One – not just Israel! While the Tabernacle was built for the people of Israel, for all who were a part of the congregation of His inheritance, the Temple was the expansion of that desire for people from all nations to worship Him. It must include the spiritual contribution of all nations. These added lights represent that wonderful reality. 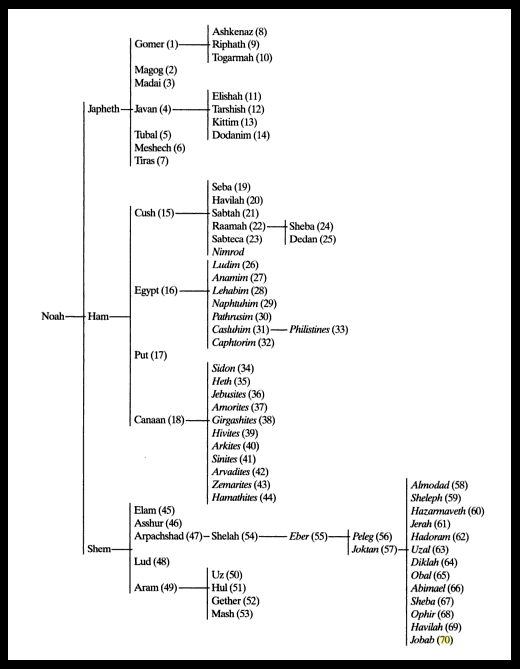 Genesis chapter 10 has a long list of all the original nations who came forth from the sons of Noah, who are now represented by all peoples in the world. The list of those peoples total the number seventy! Therefore, the total number of added lights in the Temple’s Holy Place aligns perfectly with the number of nations according to the Word, from whence have come all peoples. The people that walked in darkness, they saw a great light; those dwelling in land of death’s shadow - a light has shone upon them. I, YHWH, have called You in righteousness, I will hold-tightly with Your hand, and I will keep You, and I will give You for a covenant to a people, for a light to the nations. For with You is the fountain of life; in Your light we will see light. 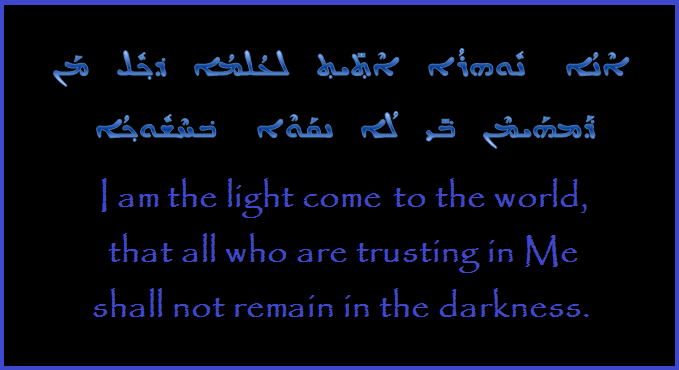 The term NUHRA appears in the Aramaic versions of the above verses, which made the rabbinic commentators see that this concept of “Light” is another way to reference the Messiah. By Yeshua’s using this term for Himself back in the book of John 12:46, He was trying to show the people that the darkness of sin could be obliterated if only man would come to Him. The entire world has access through the Righteous One to be illuminated in the pure worship of the Most High at His Temple. Hidden in the light of Holy One – the complete number of menorahs at the Temple – would lay the true Light that would bring men from all seventy nations out of darkness – Yeshua!